David Bethune died at Laidhay Dunbeath 1917 aged 93. Wife Elizabeth McKay died 1877 aged 48. Daughter Mary Bethune died 23rd January 1951 aged 88. 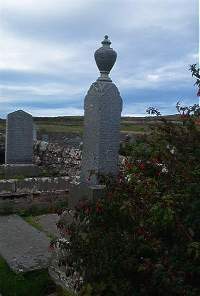 Daughter Christina Bethune died at Dunbeath 17th March 1954 aged 85. Son William Bethune 22nd April 1957 aged 91. Erected by daughters M and C Bethune.